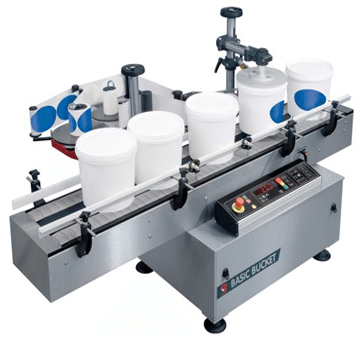 The Basic Bucket machine is designed to label pales and buckets or larger diameter containers. The proven heritage and simple operation of the Basic labeller has been combined with a dual track conveyor system with base turning to allow application of labels around the product circumference. Its clean lines and compact size make it ready to fit into existing process lines or stand alone operation.